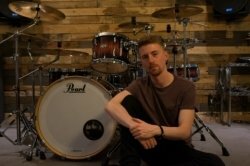 I have been playing drums for 11 years, in this time, I have played in a variety of bands and recorded with a large number of artists. Since graduating with an honours degree in Professional Music Performance from The Academy Of Contemporary Music, I have been a freelance drummer and had significant teaching experience in that time. I have been teaching privately for 2 years at my home studio in Dorking. Lessons are a time to tackle what you find difficult on the instrument, therefore, lessons are tailored to what the student needs to learn, with sheet music supplied to refer to out of lesson time. I offer grade studies if the student requests but not at the cost of sacrificing the student's enjoyment of the drums. I aim to create a comfortable environment and a friendly relationship with the student. I find this makes them more passionate about learning to play such a fun instrument.